There are always things that happen during Disney World trips that are less-than-ideal and people traveling during the first part of the year often have to handle more of that than anybody else. 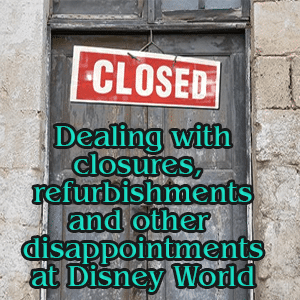 Today, we'll talk about how to deal with closures, refurbishments and other disappointments during Disney World trips. 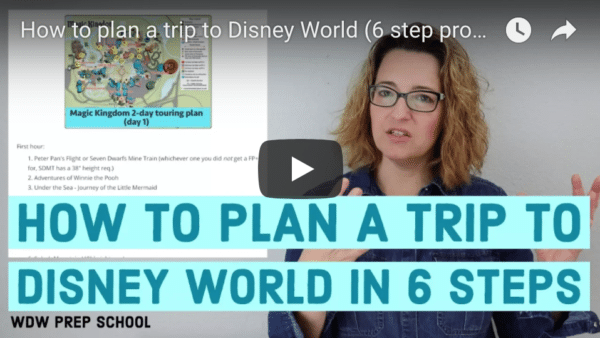 I also have a quick tip about shopping for Disney World trips when it's not summer where you live. So how do you deal with all of that? Attitude. "There are 2 ways to be happy: improve your reality or lower your expectations" is a quote I recently came across and it's a good strategy when approaching a Disney World trip that might have some disappointments. Parents in particular should make sure to frame everything in a positive way to help kids see it that way. Make new plans. If necessary, change your plans a bit. You might consider renting a car, switching to a different hotel or changing your trip dates. Focus on other things. Take the time you would have been doing something that will be closed (like seeing Festival of the Lion King) to do something else you might not have (like seeing Finding Nemo - The Musical). Research and stay flexible. Know as much as you can ahead of time about the changes and then make a plan but stay flexible during your trip. Is it cold where you are but you're headed to warm Florida for a trip? It's likely that your local Target isn't selling shorts, swimsuits and personal misting fans then. If you need to buy some of those things, be sure to look on eBay which often has a good assortment year round. Do you have concerns for things happening during your trip? NOOOOOOOOOO Miyuki is gone???? We are going next May and I was so excited to get my daughter over to hopefully get a treat. I’m very thankful I took my son six years ago to see her. He was also lucky enough to get a blue dragon. Where is the best place to find out information on scheduled closures? I tried to research via Disney’s website and couldn’t ever find the information I was looking for. Yep, that’s just what I was looking for :)! Do you think they will ever de-obnoxious Stitch’s Great Escape? I don’t think anyone would mind that refurbishment.